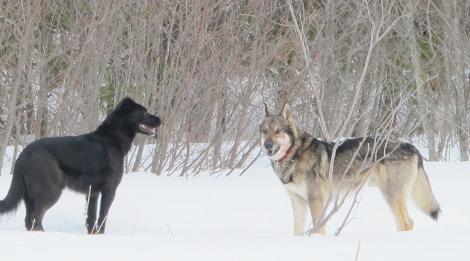 Conservation officers are hunting two dogs that the Ministry of Natural Resources says it has confirmed were responsible for killing deer in the Point Aux Pins Drive area. “If we are able to identify the dog owners, we will likely charge them and the dogs themselves are going to be shot,” said Jolanta Kowalski, an MNR spokesperson. Earlier this week, residents of Alagash Drive and Pointe Aux Pins Drive contacted SooToday.com with concerns that a pair of dogs had gone wild and killed three deer in the area. A reader provided photos of two well-cared-for dogs, one of which was wearing a collar. Kowalski said MNR staff have confirmed it is dogs that are responsible for chasing down deer and killing them. She said one of the dogs has tags, suggesting it is not a stray. She said conservation officers were out looking for the dogs Monday afternoon and that the dogs would be “dispatched” as soon as it could be done safety. She said shooting the dogs is standard practice in situations like this, which she said is not unusual. It is illegal to allow dogs to chase down deer outside hunting season, Kowalski said. “Deer are having a difficult enough time this winter as it is,” said Kowalski. Experts have warned that a large number of deer are threatened this winter due to deep snow and cold weather that has prevented the animals from getting to food sources. A helicopter pilot offered another theory about who might have been responsible for the deer carcassas after witnessing a pack of wolves north of town. Phil Glave, of Eagle Feather Aviation, said he was flying clients over the Prince wind farm about a week and a half ago when he spotted something unusual. “Much to my surprise, close (to town) and in Prince Township, we came across wolves,” said Glave.